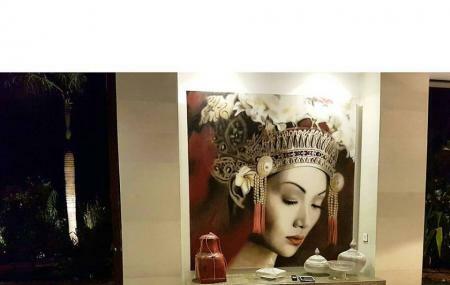 This art gallery, owned and operated by the French International luxury tourism group Nyaman, exhibits clothes, street art, photography, sculpture, jewellery, glassworks, metalworks, paintings, and handicrafts produced in Seminyak, Bali. The producers are both local and international artists. They don’t exactly have a permanent collection so check out their current and upcoming exhibition on their gallery website. The entirety of the gallery’s look and feel is derived from the philosophy of Nyaman, which refers to a state of mind that recalls comfort and softness. Take a bemo, ojek or taxi to here. Love this? Explore the entire list of places to visit in Bali before you plan your trip. Fancy a good night's sleep after a tiring day? Check out where to stay in Bali and book an accommodation of your choice. How popular is Nyaman Gallery? People normally club together Petitenget Beach and Mengiat Beach while planning their visit to Nyaman Gallery. A tourist-friendly art gallery with a touch of modern, minimalistic feel to its ambience. Well air-conditioned and you’ll feel comfortable inside, as its name implies. (Nyaman means comfortable). I’m especially fascinated by the painting upstairs (it looks very Disney-esque) and I have no idea how the painter managed to paint that. It’s very detailed and looked computer-generated. But I can definitely tell that it’s painted. A place worth visiting that showcases the art of Bali while getting yourself comfortable. I'm not a fan of commercial galleries but my experience here was superb! The staff were very friendly and I completely did not feel pressured to purchase anything. Instead the staff were more focused on allowing me to better understand the various artists in detail. There are tables and chairs where you could sit to browse the books of artists and their works. Lovely ambiance and great selection of artists based in Bali and internationally!